On February 3, two days before the Lunar New Year, Elaine updated her social media to wish her fans a happy new year, but the ambiguous message carried more subtle messages than one would expect. When reporters reached out Elaine about her daughter’s current situation, she told reporters that while Etta and Andi are moving homes frequently, they refuse to find actual work. They had relying on the money they had loaned from friends. Is it me or I feel Etta is heading for a divorce in the near future? I think she is only with Etta thinking she will get something but since she is not, she may divorce her soon which may not necessarily be a bad thing. Andi seems up to no good anyways. $300k a month? Is that a typo? Technically doing photography is a job, if you have an active customer stream. With their bad rep, that’s unfortunately no longer possible. And I don’t know… Based off this article, can people still say Etta isn’t spoiled? Their relationship as mother and daughter is a big mess, Etta life is ruined and can’t be saved until she decides to work. As for Andi it feels like she a gold digger hoping one day Jacky Chan will give a piece of his fortune to his daughter which I highly doubt that will happened. I agree and I think Andi is only with Etta because she thinks she will get a bit of Jackie’s fortune and she will get some too. But with time, she will realize that that is not the case and they will divorce. Before getting a job or education, most importantly she needs to heal herself psychologically and know what her self worth is or else a job will not help much. Yes, she needs to learn to love herself and make amends with her mom, divorce Andi if she is truly up to no good and then get her life back on track with an education and/or a job. That is only when her life can get better. Or else she will just continue to be the way she is now. @vodka Their relationship was a mess long before Andi. I dont see this marriage lasting but I dont think Ettas problematic persona will change even if they broke up. True to some extent but Andi just made things worse. The main problem is Etta herself as she already had negative thoughts about herself since her biological father does not acknowledge her existence. However, she needs to move past that which is her biggest obstacle. Her life was already a mess from the start and marrying Andi just made things worse. If Andi was a good influence on her, it would help a lot but sadly she isn’t and is making things worse. it’s said that etta refuses to see the truth, she’e been poisoned by this andi girl. this andi girl is such a bad influence for her. The power of social media – as Elaine was able to show Andi’s true nature by posting her scantily dressed posing with questionable male friends. Perhaps she wanted to further defend herself, that she isn’t the only negative influence in her daughter’s life. 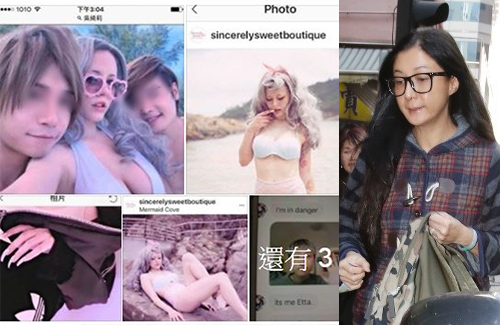 I sympathize with her anger and resentment, but not sure if posting (what some may deem as scandalous) pictures of her “daughter-in-law” will enable Elaine to gain further sympathy from her friends and general public. Not to mention that these pics were probably posted without Andi’s consent..
@marquis Part of the original article notes that Elaine publicly disclosed this to deter Etta & Andi from using these tactics on their friends & family. It’s to ‘cut them off’ from streams of passive assistance. Of course, i think she’s also doing this to spite Andi since Etta reached out to Elaine to help her. I don’t know if it’s Andi who is pushing Etta to ask Elaine or Etta decided to ask Elaine herself, but either way, it is very selfish & inconsiderate.